Jennifer Nadel is a qualified barrister who, after reporting for the BBC and Channel 4 News, became ITN’s Home Affairs Editor. Her book about Sara Thornton – the story of woman who killed her violent alcoholic husband – was published in four languages and made into a BBC Film and a C4 documentary. Her first novel, PRETTY THING, about a 15-year old girl who falls in love with an older man, was published in February 2015 by Corsair. 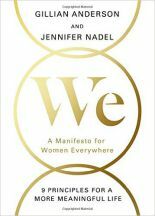 Jennifer’s inspiring non-fiction book, We: a Manifesto For Women Everywhere, co-written with Gillian Anderson, was published by HarperCollins in March 2017.